The dividends of Liquid Bees are credited directly to your Demat account. One can check the same from their CDSL account or from with CDSL app. However you would need to register with CDSL from their official site with your DP ID. Post which you login with the credentials to view the dividends of Liquid Bees credited to your Demat. You can get your DP ID from Zerodha Q console > account > My profile > Depository. And here is the quick link. 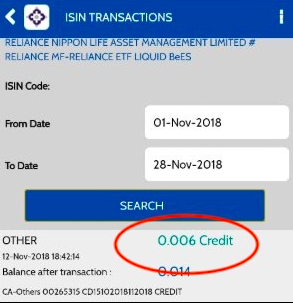 For eg, Say a sample account, If the credited amount is shown as Rs.6 as in the below snip, you will see the credited amount as "0.0006" and the value of your Liquid Bees as "2.006" If you have hold 2 units. The credited amount that you will see in CDSL App as below. Having said that, you can view the dividends from the Q console > Holdings itself. Here is the help article from Zerodha that shows how you can get it checked.